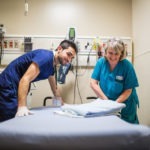 At Hamilton Health Sciences, we pride ourselves in providing highly collaborative learning environments for patients, families, staff and students. Through active participation and contributions of ‘lived experience’, patients and families help us co-design programs, services and solutions that improve the quality of patient and family care. Collaborative learning provides our staff with professional development opportunities that effectively improve team performance. Our students benefit from experiential learning opportunities that prepare them for the world of health care of today and tomorrow. We are equally proud of our commitment to leading-edge technologies to support collaborative learning and innovative approaches to measuring value created for patients, families, staff and students. Taken together, Hamilton Health Sciences understands collaborative learning is a critically important strategy to help us deliver “Best Care for All”. This is an advanced, video-based, certified, instructor-led course that builds on the foundation of basic life support (BLS) skills. It emphasizes the importance of continuous, high-quality CPR; high-performing team dynamics and communications; systems of care; recognition and intervention of cardiopulmonary arrest; immediate post-cardiac arrest care; and acute dysrhythmia, stroke, and acute coronary syndromes. The use of simulation is incorporated to provide real-time feedback on CPR effectiveness. The course uses curriculum and vigorous practice guidelines from the Heart & Stroke Foundation. Hamilton Health Sciences values and supports excellence and innovation in patient care, education and research. The Office of Student Affairs collaborates with our academic and community partners to offer a myriad of both clinical and non-clinical learning opportunities. We endeavor to provide our learners in health professions, research, high school co-op and other programs, with the best possible experience across our multi-site organization. Learn more about these learning opportunities and how to apply. Hamilton Health Sciences offers a number of resources for staff, including orientations, workshops, and staff libraries. Learn more about these resources below. Hamilton Health Sciences is committed to engage, empower and enable our people to deliver on our mission. Orientation welcomes all new staff and introduces the values and culture of the organization, who we are and where we are going. This is coordinated through an orientation pathway, complemented with program, service and area specific orientation. Role specific along with interprofessional orientation experiences, strengthen contributions to the broader teamwork and interprofessional practice that is required to deliver on our mission. Learn more about orientations offered at HHS. Hamilton Health Sciences supports our care teams with the following workshop opportunities. Health professional colleagues with other organizations are welcome to contact us to learn more about attending our workshops. Learn more about workshops offered at HHS. The staff libraries at Hamilton Health Sciences (HHS) provide access to quality health information for hospital staff, associated physicians and residents, and learners. All electronic resources, including books, journals and databases, can be found on the HHS Intranet through the library portal called the Clinical Reference Library. Print collections and study space can also be found at the Hamilton General Hospital, Juravinski Hospital, McMaster University Medical Centre (MUMC), and St. Peter’s Hospital sites.